Seldom does one find a work of such determined invention and artistry. If you delight in baffling card magic and exquisite sleight-of-hand—in magic that puts you a running cut ahead of your competition—you'll want By Forces Unseen. This is the book that made me wanna practice card magic after having abandoned it for years. The tricks in here are so innovative that even though they are hard you just feel like you have to practice them!! Steven Minch is just pure gold! Everything is so well thought out and well put together! 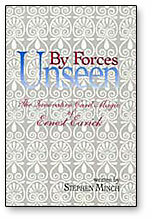 By Forces Unseen is awesome! It's a wonderful book to have in my collection!